Enterprising sixth-formers from Ken Stimpson Community School have scooped no less than six awards for the unique travel guide to the UK that they created. The Fantastic 50 Guide includes Peterborough Cathedral amongst its featured attractions and is now on sale in the Peterborough Cathedral shop, both online and over the counter. The guide was developed, written and designed by Eminence, the Young Enterprise company set up by eight pupils from the school. 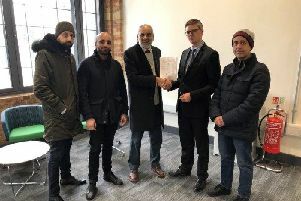 It was professionally printed in Peterborough and the team both raised funds to cover production costs and sold copies at trade fairs and through their personal networks, meaning that they are now in profit. The work of Eminence in producing the guide was considered so strong that it won the Young Enterprise area finals at Peterborough High School, as well as the county championships at Robinson College Cambridge. Individual members of the team have also won awards for their work on the project. Eminence was eventually a finalist for Young Enterprise East of England. The Fantastic 50 Guide features 50 places of interest across England, Scotland, Wales and Northern Ireland, with brief information about each and space to add a personal photo and notes about your own visit to that location. Chris Campbell, managing director of Eminence, said: “We thought families with young children would particularly like the guide because it not only sets them a challenging list of places to go, but also has space to put their own pictures and comments. The team selected the places featured in the book by researching them online and checking their popularity and significance. Their aim was to include different types of destination, from natural features to historic buildings and cultural landmarks. Kevin Abbott, head of faculty for business & social sciences, said: “The students have done superbly well this year and the school is very proud of their achievements. Working alongside Chris Campbell and Penelope Morrison were fellow Eminence team members Chris Wright, Ashton-Lauren Jackson, Ashley Smith, Bradley Sawkins, Andrezza Mendes and Caleb Warburton. The team were encouraged by their link teacher Kevin Abbott and their business adviser Ray Rankmore. The Fantastic 50 Guide is on sale at £10.00 at the shop inside Peterborough Cathedral and also online at http://shop.peterborough-cathedral.org.uk/. Eminence has begun developing an interactive App to complement the book and they also encourage readers to post their comments and photographs online at: https://www.facebook.com/EminenceYoungEnterprise.